Mit transdisziplinären und Partizipative Action Research-Ansätzen werden gemeinsam mit Landnutzern existierende Anpassungsstrategien an Dürre und Klimawandelbedingungen identifiziert, bewertet und, wo angemessen, weiter entwickelt. Hudson, L.N., Newbold, T., Contu, S., Hill, S.L.L., Lysenko, I., De Palma, A., Phillips, H.R.P., [...] , Schmiedel, U., [...] and Purvis, A. (2017): The database of the PREDICTS (Projecting Responses of Ecological Diversity In Changing Terrestrial Systems) project. Ecology and Evolution 7(1): 145-188. Schmeller, D.S., Böhm, M., Arvanitidis, C., Barber-Meyer, S., Brummitt, N., Chandler, M., Chatzinikolaou, E., Costello, M.J., Ding, H., García-Moreno, J., Gill, M., Haase, P., Jones, M., Juillard, R., Magnusson, W.E., Martin, C.S., McGeoch, M., Mihoub, J.-B., Pettorelli, N., Proença, V., Peng, C., Regan, E., Schmiedel, U., Simaika, J.P., Weatherdon, L., Waterman, C., Xu, H., and Belnap, J. (2017): Building capacity in biodiversity monitoring at the global scale. Biodiversity and Conservation1-26. Marques, M., Schwilch, G., Lauterburg, N., Crittenden, S., Tesfai, M., Stolte, J., Zdruli, P., Zucca, C., Petursdottir, T., Evelpidou, N., Karkani, A., AsliYilmazgil, Y., Panagopoulos, T., Yirdaw, E., Kanninen M, Rubio, J., Schmiedel, U., Doko, A. (2016): Multifaceted Impacts of Sustainable Land Management in Drylands: A Review. Sustainability 8, 177: 1-34. Schmiedel, U., Araya, Y.N., Bortolotto, I.M., Boeckenhoff, L., Hallwachs, W., Janzen, D.H., Kolipaka, S., Novotny, V., Palm, M., Parfondry, M., Smanis, A. & Toko, P. (2016): Contributions of paraecologists and parataxonomists to conservation and social development. Conservation Biology pp32: 506-519. Schmiedel, U., Röwer, I. U., Luther-Mosebach, J., Dengler, J., Oldeland, J. and Gröngröft, A. (2016): Effect of grazing on vegetation and soil of the heuweltjieveld in the Succulent Karoo, South Africa. Acta Oecologica 77: 27-36. Melka, Y., Kassa, H., Ketema, M., Abebaw, D. & Schmiedel, U. (2015): The effect of drought risk perception on local people coping decisions in the Central Rift Valley of Ethiopia. Journal of Development and Agricultural Economics 7: 292-302. Schmiedel, U.,Kühne, N., Twerski, A. and Oldeland, J. (2015): Small-scale soil patterns drive sharp boundaries between succulent “dwarf” biomes (or habitats) in the arid Succulent Karoo, South Africa. South African Journal of Botany 101: 129-138. Bösing, B.M., Haarmeyer, D.H., Dengler, J., Ganzhorn, J.U., Schmiedel, U. (2014): Effects of livestock grazing and habitat characteristics on small mammal communities in the Knersvlakte, South Africa. Journal of Arid Environments 104: 124-131. Muche, G., Oldeland, J., Petersen, A., Porembski, S., Rutherford, M.C., Schmidt, M., Sinsin, B., Strohbach, B. J., Thiombiano, A., Wittig, R., Zizka, G. (2012): The BIOTA Biodiversity Observatories in Africa – A standardized framework for large-scale environmental monitoring. Environmental Monitoring and Assessment 184: 655–678. Luther-Mosebach, J., Dengler, J., Schmiedel, U., Röwer, I. U., Labitzky, T., Gröngröft, A. (2012): A first formal classification of the Hardeveld vegetation in Namaqualand, South Africa. Applied Vegetation Science 15: 401–431. Schmiedel, U., Dengler, J., Etzold, S (2012): Vegetation dynamics of endemic-rich quartz fields in the Succulent Karoo, South Africa, in response to recent climatic trends. Journal of Vegetation Science 23: 292–303. Sop, T. K., Oldeland, J., Schmiedel, U., Ouedraogo, I., Thiombiano, A. (2011): Population structure of three woody species in four ethnic domains of the Sub-Sahel of Burkina Faso. Land Degradation and Development. 22: 519–529. Haarmeyer, D. H., Bösing, B. M., Schmiedel, U., Dengler, J. (2010): The role of domestic herbivores in endozoochorous plant dispersal in the arid Knersvlakte, South Africa. South African Journal of Botany 76: 359–364. 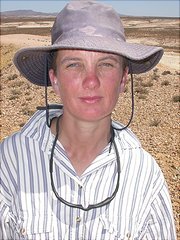 Haarmeyer, D. H., Schmiedel, U., Dengler, J., Bösing, B. M. (2010): How does grazing intensity affect different vegetation types in arid Succulent Karoo, South Africa? Implications for conservation management. Biological Conservation 143: 588–596. Musil, C. F., van Heerden, P. D. R., Cilliers, C. D., Schmiedel, U. (2009): Mild experimental climate warming induces metabolic impairment and massive mortalities in southern African quartz field succulents. Environmental and Experimental Botany 66: 79–87. Schmiedel, U., Mucina, L. (2006): Vegetation of quartz fields in the Little Karoo, Tanqua Karoo and eastern Overberg (Western Cape Province, South Africa). Phytocoenologia 36: 1–44. Musil, C. F., Schmiedel, U., Midgley, G. F. (2005): Lethal effects of experimental warming approximating a future climate scenario on southern African quartz-field succulents: a pilot study. New Phytologist 165: 539–547. Meve, U., Schmiedel, U., Marais, E. M. (2000): Pelargonium quarciticola (Geraniaceae), a new species from the Knersvlakte. South African Journal of Botany 66: 96–98. Akhtar-Schuster, M., Schmiedel, U. (2011): Artenvielfalt und Desertifikation - Landverödung in Trockengebieten. In: Lozán, J., Graßl, H., Hupfer, P., Karbe, L., Schönwiese, C.-D. [Ed. ]: WARNSIGNAL KLIMA: Genug Wasser für alle?. pp 375–380. GEO, Hamburg. Hoffman, M. T., Schmiedel, U., Jürgens, N. (2010) [Eds. ]: Biodiversity in southern Africa. Volume 3: Implications for landuse and management. XII + 226 pp. Klaus Hess Publishers, Göttingen & Windhoek. Schmiedel, U., Jürgens, N. (2010) [Eds. ]: Biodiversity in southern Africa. Volume 2: Patterns and processes at regional scale. XII + 348 pp. Klaus Hess Publishers, Göttingen & Windhoek. Schmiedel, U., Linke, T., Christiaan, R. A., Falk, T., Gröngröft, A., Haarmeyer, D. H., Hanke, W., Henstock, R., Hoffman, M. T., Kunz, N., Labitzky, T., Luther-Mosebach, J., Lutsch, N., Meyer, S., Petersen, A., Röwer, I. U., van der Merwe, H., van Rooyen, M. W., Vollan, B., Weber, B. (2010): Environmental and socio-economic patterns and processes in the Succulent Karoo frame conditions for the management of this biodiversity hotspot. Biodiversity in southern Africa. Volume 3: Implications for landuse and management. 109–150. Klaus Hess Publishers, Göttingen & Windhoek. Schmeller, D.S., Arvanitidis, C., Böhm, M., Brummitt, N., Chatzinikolaou, E., Costello, M.J., Ding, H., Gill, M.J., Haase, P., Julliard, R., García-Moreno, J., Pettorelli, N., Peng, C., Riginos, C., Schmiedel, U., Simaika, J.P., Waterman, C., Wu, J., Xu, H., and Belnap, J. (2017): Case Studies of Capacity Building for Biodiversity Monitoring. In: M Walters and RJ Scholes: GEO Handbook on Biodiversity Observation Networks. 309-326. Springer International Publishing: Cham. Muche, G., Schmiedel, U., Jürgens, N. (2012): BIOTA Southern Africa Biodiversity Observatories Vegetation Database. Biodiversity & Ecology 4: 111–123. Biocentre Klein Flottbek and Botanical Garden, University of Hamburg. Schmiedel, U. (2011): Para-ecologists can support adaptation to climate change. In: Davis, C. L. [Ed. ]: Climate Risk and Vulnerability: A Handbook for Southern Africa. p. 74. Council for Scientific and Industrial Research, Pretoria, South Africa. Falk, T., Schmiedel, U., Zimmermann, I., Joubert, D. F., Pröpper, M., Gruber, M., Koelle, B., Domptail, S. E., Kohrs, B., Oettle, N. (2010): BIOTA's strategies for stakeholder interaction and capacity development. In: Schmiedel, U., Jürgens, N. [Ed. ]: Biodiversity in southern Africa. Volume 2: Patterns and processes at regional scale. pp. 308–310. Klaus Hess Publishers, Göttingen & Windhoek. Hanke, W., Schmiedel, U. (2010): Restoring degraded rangelands in the Succulent Karoo: lessons learnt from our trials. In: Hoffman, M. T., Schmiedel, U., Jürgens, N. [Eds. ]: Biodiversity in southern Africa. Volume 3: Implications for landuse and management:. 109–150. Klaus Hess Publishers, Göttingen & Windhoek. Schmiedel, U., Linke, T., Christiaan, R. A., Falk, T., Gröngröft, A., Haarmeyer, D. H., Hanke, W., Henstock, R., Hoffman, M. T., Kunz, N., Labitzky, T., Luther-Mosebach, J., Lutsch, N., Meyer, S., Petersen, A., Röwer, I. U., van der Merwe, H., van Rooyen, M. W., Vollan, B., Weber, B. (2010): Environmental and socio-economic patterns and processes in the Succulent Karoo frame conditions for the management of this biodiversity hotspot. In: Hoffman, M. T., Schmiedel, U., Jürgens, N. [Ed. ]: Biodiversity in southern Africa. Volume 3: Implications for landuse and management. 109–150. Klaus Hess Publishers, Göttingen & Windhoek. Schmiedel, U., Mtuleni, V. S., Christiaan, R. A., Isaacks, R. S., Kotze, D., Lot, M. J., Mukuya, R. S., Pieters, W., Swartbooi, J., Swartbooi, S. (2010): The BIOTA para-ecologist programme towards capacity development and knowledge exchange. In: Schmiedel, U., Jürgens, N. [Ed. ]: Biodiversity in southern Africa. Volume 2: Patterns and processes at regional scale. 319–325. Klaus Hess Publishers, Göttingen & Windhoek. Zimmermann, I., Schmiedel, U., Cupido, C. (2010): Learning from each other: participatory research with landusers on management applications. In: Schmiedel, U., Jürgens, N. [Ed. ]: Biodiversity in southern Africa. Volume 2: Patterns and processes at regional scale. 311–318. Klaus Hess Publishers, Göttingen & Windhoek. Schmiedel, U. (2002): Conophytum and the southern African quartz fields. In: Hammer, S. A., Opel, M., Schmiedel, U., Smale, T., Jürgens, A., Witt, T., Rodgerson, C. [Ed. ]: Dumpling and His Wife: New Views of Conophytum N. E. Br. 349–362. East Anglia Engraving, Norwich. seit 2013 Wissenschaftliche Mitarbeiterin im SASSCAL Task 159 "Strengthening a regional Biodiversity Observation Network in the region"